My absolute priority is to deliver an impeccable product with flawless craftsmanship. Every single pebble that is laid in your home or garden is ingrained with love and passion. Pebble mosaic of 3m in diameter installed at a clients’ private home in Ponsonby, Auckland. Pebble mosaic path of 7x1.2m installed at a holiday home on Waiheke Island near Auckland. Pebble mosaic of 1.6x1.3m was installed inside a private residence in Beachlands, Auckland. Pebble mosaic of 2m in diameter installed at a private residence in rural Oratia, Auckland. Pebble mosaic of 3m in diameter installed at a private property over looking the Waitakere Ranges. 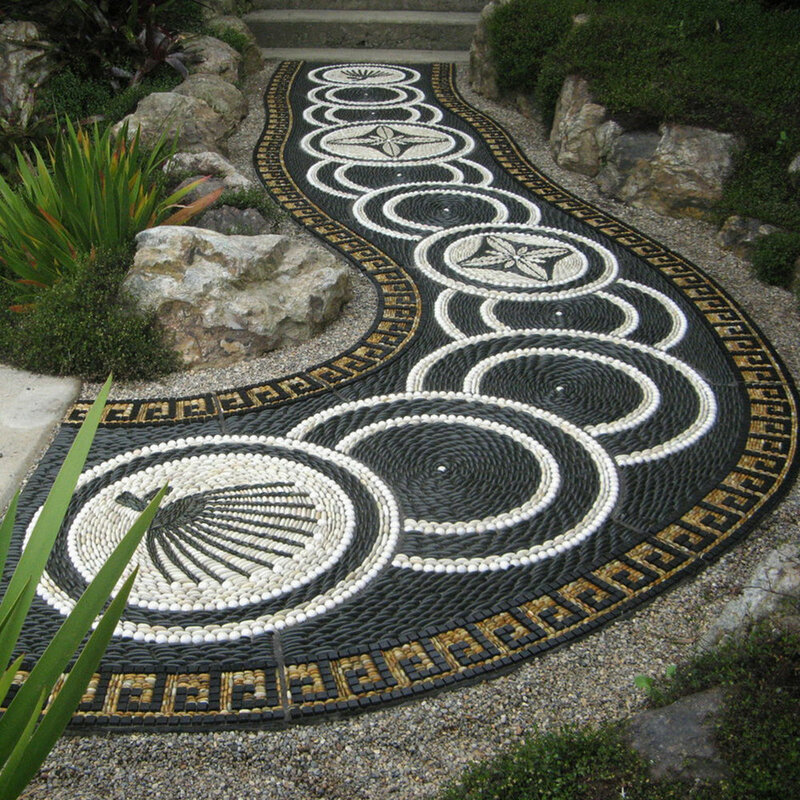 Pebble mosaic of 1.3x1.3m commissioned by Ayrlies Gardens near Whitford, Auckland. Pebble mosaic of 3m in diameter was installed at a private residence in the Pacific Islands. Pebble mosaic of 2m in diameter was installed at a private residence in Beachlands. This checkered compass rose in a triangle - base 2.7m will be installed in Wellington, New Zealand for a private garden. Pebble mosaic of 2m in diameter installed at a private residence in One Tree Hill, Auckland. Pebble mosaic of 3.2x1.2m installed at a holiday home on Waiheke Island near Auckland. Pebble mosaic of 2x1m was installed at a private residence in Naseby on the South Island. Pebble mosaic of 2.5m in diameter installed at a private residence in Seatoun, Wellington. Pebble mosaic of 2.4m in diameter installed at a private residence in east Auckland. Pebble mosaic of 1.8x0.8m shown for the first time at International Ellerslie Flower Show in Auckland. Pebble mosaic of 2.4m in diameter installed at a private residence in Remuera, Auckland. Pebble mosaic of 1.5m in diameter depicting the huia, the most sacred bird of New Zealand, was installed at a private residence in Freemans Bay. This Monarch Butterfly of 1.5m in diameter was presented at the Melbourne Flower and Garden Show 2018. Pebble mosaic of 2x2m installed at a private residence in Dunedin on the South Island, New Zealand. Pebble mosaic created and exhibited for an exhibition at Pataka Museum in Porirua, near Wellington. This pebble mosaic was completed in 2012 and is 2.4x1.6m in size. Available for sale, please enquire for details. Pebble mosaic of 2m in diameter installed at a private residence in Seatoun, Wellington. Pebble mosaic of 4m X 3m installed in the driveway of a private residence in St. Heliers, Auckland. Pebble mosaic of 2x2m installed at a private residence in rural Whitford, Auckland. Pebble mosaic of 3m in diameter installed at a private residence in Manukau, Auckland. 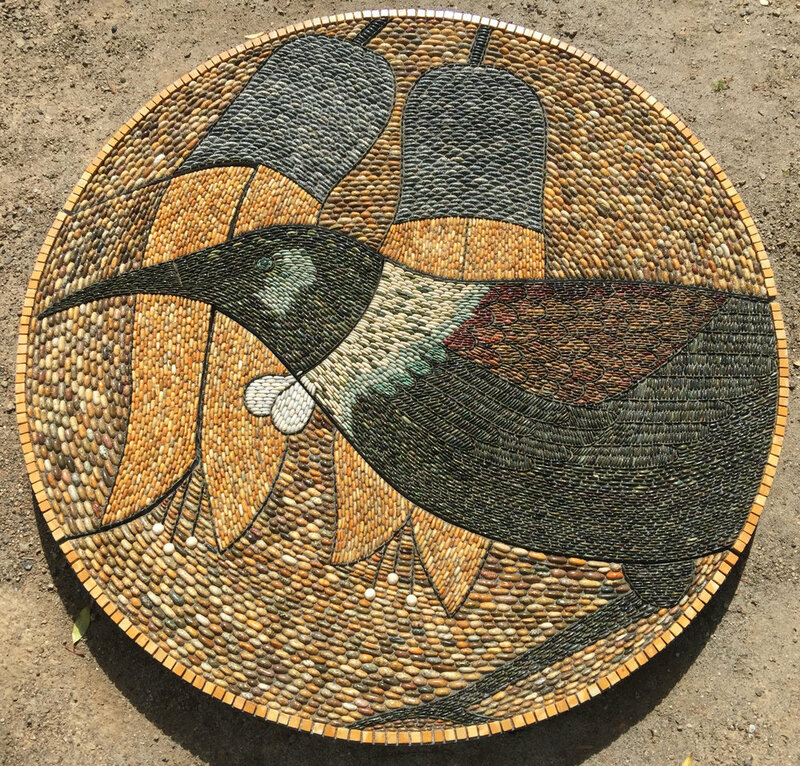 Pebble mosaic of 1.5m in diameter depicting the tui, endemic bird of New Zealand presently for sale at Moko Artspace. This mosaic of 1.6m in diameter will be presented at the New Zealand International Flower & Garden Show 2018.